Everyone wants the best price on tires for their car, truck or SUV and the Gresham Quick Lane understands. Our trained tire experts help you choose the best tire for your car and your driving needs. Enjoy knowing that the Quick Lane maintains a LOW PRICE TIRE GUARANTEE. No one beats the Quick Lane on price; not even Costco or discount tire stores. So when you want tires for less, look no further that the Quick Lane Tire and Auto Center in Gresham. It only takes a penny to tell if you need new tires. Put your penny upside down in your tire’s tread grooves. If you see Lincoln’s hair your tread has worn to less than 2/32 of an inch and is a strong indicator that you need new tires. 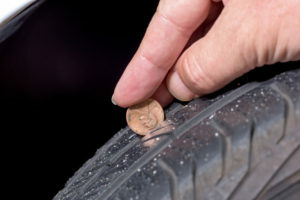 You should put the penny a few different places on each of your tires to gain a better perspective of your tire’s wear. Inconsistent wear patterns due to low tire pressure can also lead to premature wear on your tires. Simply, the more tread on your tires the more control you have while driving. With all of the rain, sleet and drizzle that Oregon throws at us you need all the tread you can get. If you need advice about whether it’s time to replace your tires, just visit the Gresham Quick Lane and speak to one of our Service Advisors.